There are many different types of electric motors, but there are three types used mainly in HVAC and refrigeration applications. Eddy currents are naturally created magnetic fields in processor controls that counteract what the machine is trying to accomplish. In traditional motors the eddy currents cannot be controlled, and therefore the machine must work harder because it is also working against itself. 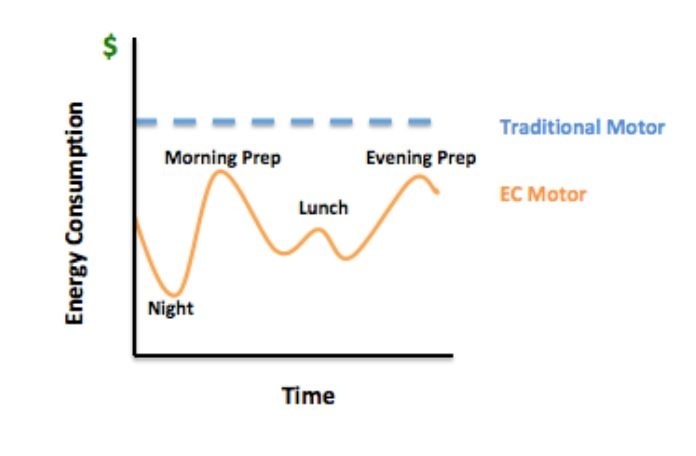 Check out this graph showing how the two types of motors compare in energy consumption throughout a typical day. The microprocessor is also programmed with the capability to retain constant parameters in changing environments. For example, traditional motors are built to fire at one speed all the time. If it is 2 am, and no one has opened the cooler door in five hours, a traditional motor will still be working just as hard as if it’s the holiday season, and every baker is constantly in and out of the cooler trying to keep up with the 50,000 baklava order demand. ECMs can be equipped with controls. This allows the motor to sense inactivity each night, and will automatically decrease the fan speed. Or it can sense when it’s baklava crunch time, and will fire the fans on high to accommodate the load. Matching the speed of the motor to the environmental fluctuations enables the motor to operate as efficiently as possible, and therefore leads to energy cost savings. Is your refrigerator running? If so, you better catch it before it costs you way too much money. Fun loving, adventurer type trying to save the world one watt at a time. Previous How Do LEDs Perform for Exterior Lighting? Next Can You "Plug & Play" with Led Tubes?